If you are like me you have found that the spam in your email box is getting worse and worse almost daily. Of course for most of us that have a computer, iPad and smart phone, it is even worse. As president of IPA and publisher of IMPress magazine, my written, photographic and video works and email address is all over the internet, which is not a good thing. All the robots that troll the internet for email addresses seem to have found mine. It is not uncommon for me to have as many as a thousand or more emails in any one of my email accounts in a single day and until the other day, I didn’t realize that 90% of it was spam. I had thought of deleting my email accounts, changing my name on my main account, but then realized there was no way to do this because of the hundreds of sites and articles my email address appears. The other day I had sent an email to an exhibitor at a trade show I was going to cover and received this email reply. See image on the right. 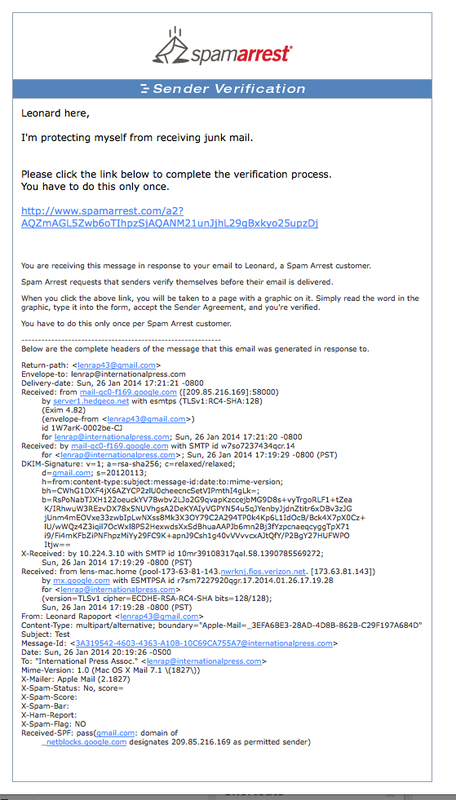 The email message explained that he was receiving lots of spam and asked me to click to verify I was a real person. Since it came from a source I knew and I had heard of SpamArrest I clicked on the link. Once I did I was now authorized by him to send him emails. As it said in the email I received, this was a one time request and once I clicked on the link, my “Sender” address was now put on his “Authorized List” of email addresses. I was intrigued by this notice and had been frustrated lately by the enormous amounts of spam so I was desperate to find a solution for this ongoing problem. This email from the exhibitor came at just the right time. Needless to say, I am now a SpamArrest client and fell in love with their system that I immediately signed on to be one of their affiliates so I could help others and began to use it myself. SpamArrest is an easy to understand and set-up system. You can set up any email account you have, even those with Google, Yahoo, AOL and others. I have five active email accounts three on our web servers and a Gmail and Yahoo account too. The spam I get comes into my three website email accounts they are POP3 and IMAP accounts and SpamArrest will work with all of them on a PC or Mac because it is not computer or browser related. When you set up your account, you are asked to list the email accounts you want to protect. 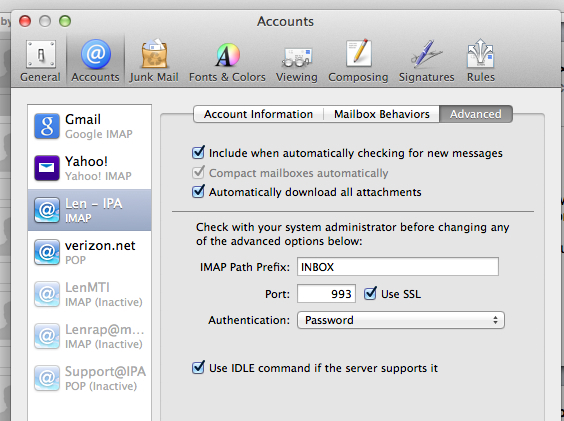 You then supply your Incoming Mail information, which you can find in your emails settings. It is usually mail.yourwebsite.com. You then complete your login for that email account so SpamArrest can log in to your account to pick up your incoming mail. You can select a short name for your account so it shows up in your account list…like My Yahoo or IPA or anything you want and you can color code the accounts so when you receive your mail you will know which account it is from. All of your accounts mail will be delivered to the one INBOX at the SA, so the color coding helps you see which email account the emails are coming from. Once you complete this information and fill in your email settings, SpamArrest will be able to login to your email accounts and retrieve your emails as you once did. Now here is the best part…you no longer will be downloading your emails from your email accounts directly to your computer, iPad or Phone. SpamArrest will. 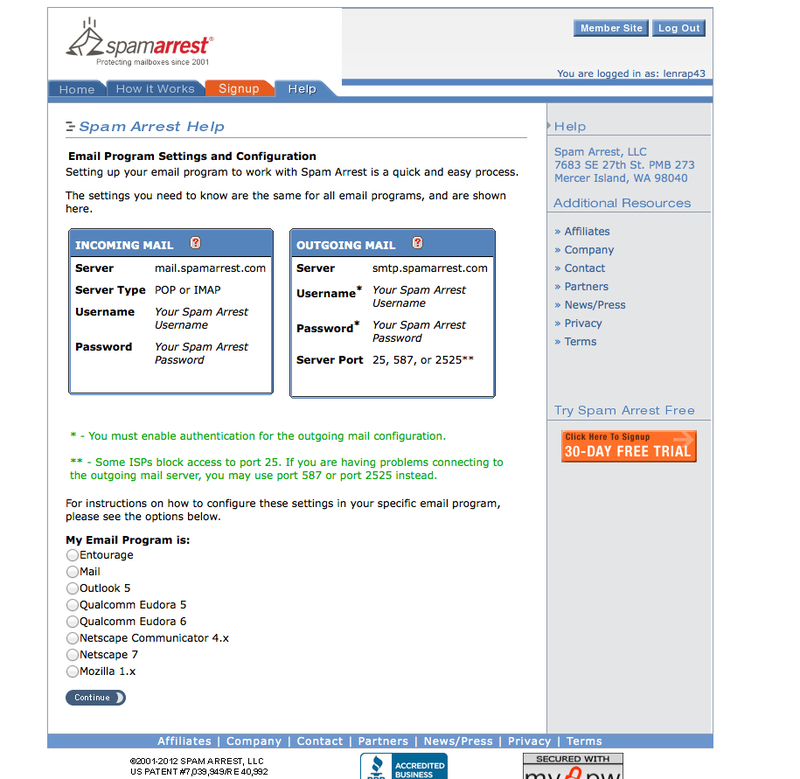 You will now set up your email client, Outlook, Thunderbird, Mail, or others to retrieve your mail from mail.spamarrest.com and you will use your SA username and your password, the one you use to log in at Sato give it that access to your mail. 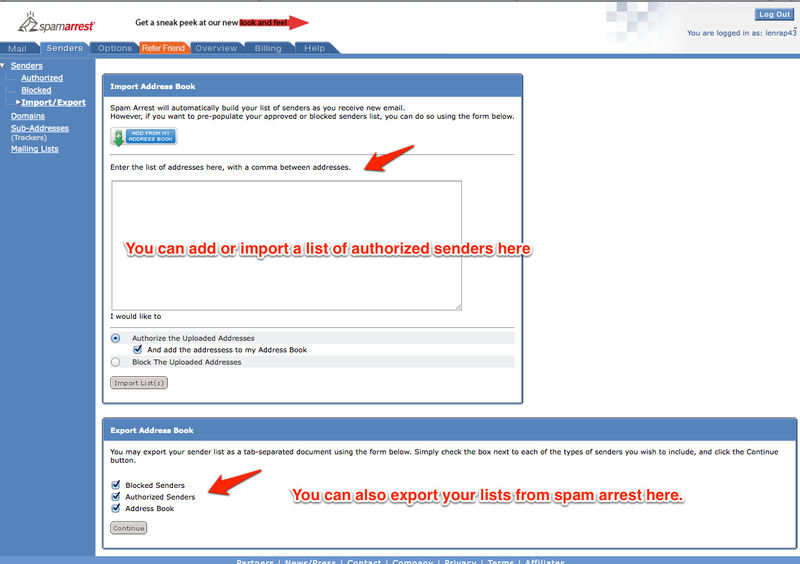 From the day you sign up, you will never again receive spam in any of your devices. Your scrubbed and cleaned emails will be delivered directly from their servers to your devices. Well it is a complex process but oh so user-friendly. Once you set up your accounts, you need to Authorize those email addresses you want to pass through their system and delivered to you. You can do it a few ways. The best way to start is to load in the email addresses you know you receive mail from on a regular basis. You can do this entry either one at a time or create a comma delineated list (some programs allow you to export your list this way) and paste it into the SpamArrest window to authorize all of these addresses. 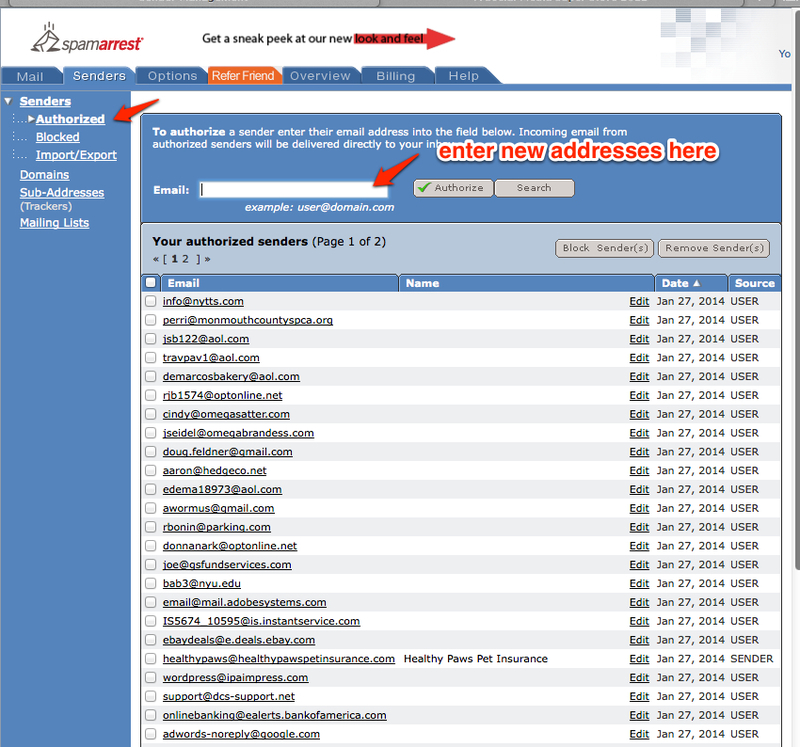 Now as SpamArrest receives your emails it will put the new ones in the “Unverified” folder in your SA webmail account. Those that come in that were in your Authorized list can be found in your INBOX. Now you will look at the Unverified emails and select the ones you want to Authorize or put on the good guy’s list. As you do this they will disappear from the Unverified box and show up in your INBOX. They will also be sent to your email account on your computer, iPad or phone. Over the next few weeks, you will continue to scan the Unverified directory and see if there are any emails coming in from your bank, credit card companies, businesses you want to hear from and anyone else. You will continue to Authorize them. Once you authorize an email you will not have to do this again. It is so easy to do. I have a Pay Pal account, my insurance company, others that are sent to me by their systems and I need to receive them. They don’t have a human that can click the link to authorize when SpamArrest sends it out their authorization requests. Those emails will only work on a human, not the auto-mail you also receive. So you have to manually Authorize these yourself. I was amazed to see just how many emails were blocked in only an hour or two. Now remember I have three email accounts set up at SpamArrest, so I had at least 6 pages of 40 emails on every page and this continued each time I looked. I was averaging around 120 spam email per hour. Now, remember these also hit my iPad and phone too and you have to delete those one at a time on these devices. How many emails do you receive from “Walk In Tub” “Ashley Madison” “Jillian Michaels and Dr Oz”? Here is a screen shot of just one page from my account. It is easy to scan through this page, Authorize the ones I want and for all the others, simply click on the one box on the top left of the page and then delete the entire page. Better than trying to delete 40, one at a time, right? The system is set to also delete any emails in the Unverified directory after 7 days. So be sure to check in and authorize those you want before they are deleted. Now set up is relatively easy and hopefully, this article will help you as well, but for me, I did find I needed some support because their FAQ’s and other links didn’t cover some of the questions I had. I wasn’t sure how the system worked at first. Wasn’t clear on how to set up my current email account to download the clean emails from SpamArrest. Lucky for me, they do offer customer support, even though I was on my free 30 day trial and hadn’t paid them yet. you can’t figure it out, you just might cancel your subscription after the free period was over? Jake at SpamArrest emailed me and asked me to click a link so he could join me on my computer and actually take over and make the corrections and set up. It was so cool because we were able to chat through their chat system window. I was able to ask questions and get answers, like how would I set up the iPad and phone to receive the clean emails there. The answer is to simply do as we did on the computer, go into the incoming mail settings and change them to the mail SpamArrest.com settings. One thing he did do that I wouldn’t have done was to make a Port setting change on my email accounts to Port 993 instead of the one I was using for my server. Once he did this everything worked and all the emails that were Authorized started to come into my email account on my desktop mail program. Note: Changing the port setting may not be necessary. If you find your cleaned emails are not coming into your email program, then see if a port change is required. I later found a reference to changing ports on their site, but it was nice to have someone take me by the hand and help me. Again, this was really easy, once you realize how this works. They log in to your email accounts, they download all your email, they check the email for spam and filter it. Then you come in and delete the junk mail, authorize the good guys and once done, those authorized emails rush to your computer, iPad or phone. Eventually, I won’t even have to check the spam to Authorize as often because all the emails or senders I know and trust will already have been cleared. Can’t be any better than that. Overview of my account for one day. 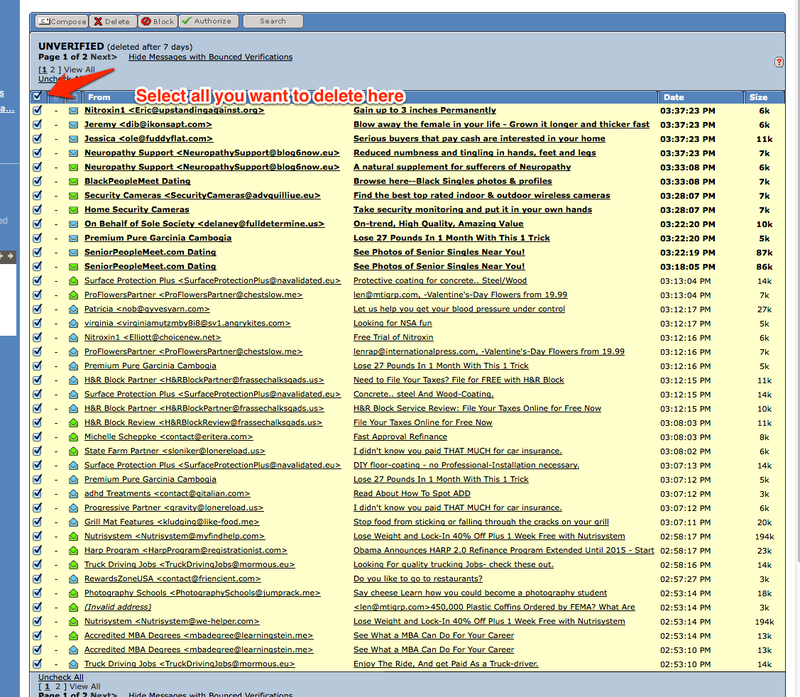 copy of your inbox mail to another email address and some other cool tools you can use. I like their Overview tab that shows you how many emails they processed and how many were actually forwarded (Authorized). 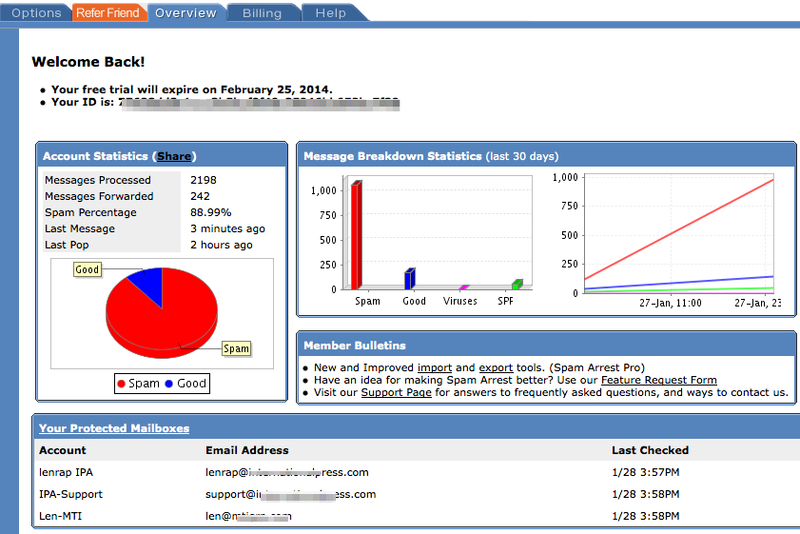 You can see from this screen shot from their graph how many spam messages I got in one day. I simply have to give this my top ratings a full 5 Star for a service that does what it promises and doesn’t take any prisoners. They will kill the spam you are now getting… guaranteed. You won’t spend hours anymore deleting all that spam and you will never accidentally delete messages you wanted. At a cost of pennies each day, you have the piece of mind and are back in control. The cost is only $29.95 for a six month subscription and you get the first month free, so 7 months in the beginning for the $29.95. You can decide before they bill you for the 6 months on other options. A 12-month subscription is $49.95 and a two-year subscription is $89.95 and payment is made using Pay Pal so they accept credit cards and other forms of payment through Pay Pal. Click Here to sign up for your FREE Trial Offer now. By doing so you can help support IPA and IMPress Magazine and get the same great offer from SpamArrest. Your support enables us to continue our good work and interesting and important articles, reviews, photos and videos to you and the thousands of readers that visit our site each month. Here are a number of screen shots that can help you understand how this system works. Click to enlarge any image. To return to article click your browsers back arrow. Email Notification can be customized . Spoofed my name in fake email addresses. Overview of my account less then one day. This is your Authorized Senders list . You can add to this list too.